The Milwaukee area’s French heritage predates the history of the city. For thousands of years, the area at which Milwaukee would be founded was populated by American Indian groups. During the seventeenth century, French missionaries and fur traders, representing both France and the French colony of New France, began to populate areas of northern Wisconsin. By the eighteenth century, fur traders of French descent had made their way to the area that would become Milwaukee, engaging in exchange with the area’s American Indian population and forming small settlements. Some of these traders had been sent into the western portions of New France with the directive to act as Christian missionaries in addition to their commercial activities, but throughout the colony it appears that these early French settlers had less interest in founding permanent communities and religious conversion than in extracting wealth. What would become the state of Wisconsin passed to British control in 1763 and then to the infant United States of America after the Revolutionary War. The French fur trade led to the development of what became the City of Milwaukee, with a French-Canadian settler considered to be the city’s founder. In 1795, the French fur trader born in pre-incorporation Montreal, Jacques Vieau, opened a trading post on a bluff overlooking the Milwaukee and Menomonee Rivers. In 1818, Laurent Solomon Juneau, originally born in a small village near Montreal and the son-in-law of Jacques Vieau, arrived in the area, where Vieau transferred his assets to Juneau. Solomon Juneau typically is recognized as Milwaukee’s first permanent resident and also its founder. 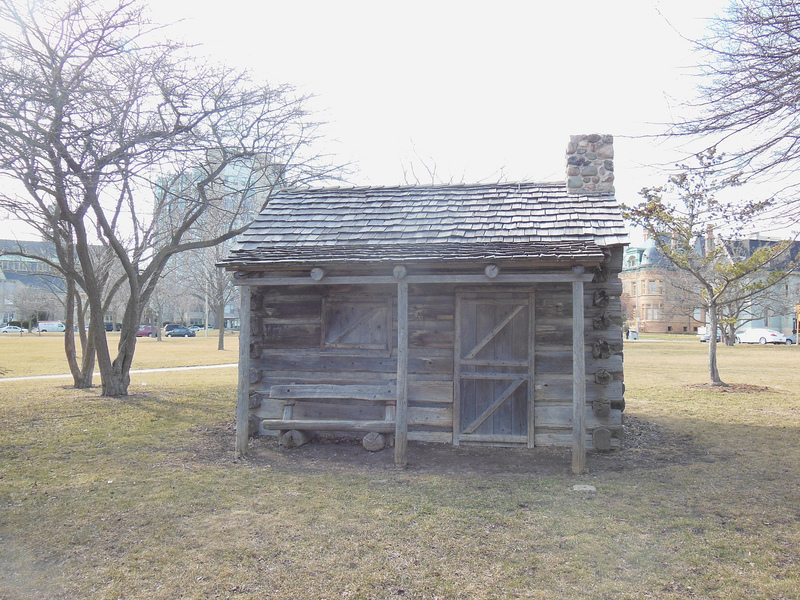 In 1822, he built the first log cabin in the area. By 1833 he and Morgan Martin began to develop a village on the east side of the future Milwaukee. Two years later, Juneau and Martin laid out the city’s early streets and drew up plots of land for sale to settlers. When Milwaukee incorporated as a city in 1846, Juneau became the city’s first mayor. Despite the prominence of Solomon Juneau in the early history of the city, the French presence in Milwaukee and within Wisconsin declined along with the fur trade, beginning in the 1830s. By the time of the city’s incorporation in the mid-1840s, Americans from the East Coast, and new European immigrants, notably Germans, already were beginning to arrive and establish their foothold in the burgeoning industrial sector while also making their mark on the cultural identity of the city. While French influence on Milwaukee was strongest in the eighteenth and early nineteenth centuries, a French cultural presence remains. In the early 21st century, some 45,000 people in the Milwaukee area report French ancestry in the census. The Alliance Francaise de Milwaukee (French Alliance of Milwaukee), based in Shorewood, is dedicated to promoting the culture and language of the French-speaking world. Most of these efforts are conducted through language-learning classes for area residents. The French Alliance also is a sponsor with the East Town Association of the annual Bastille Days celebrations in Milwaukee, named after the French National Day. The Bastille Days celebration, which is centered on a replica of the Eiffel Tower, is held in the middle of July in downtown Milwaukee. Participants can take part in a 5K “Storm the Bastille” run, while also enjoying traditional French cultural foods, drinks, and goods. ^ Desmond Morton, A Short History of Canada 3rd ed. (Toronto: McClelland and Stewart, Inc., 1997), 24-29; Reuben Gold Thwaites, Wisconsin: Americanization of a French Settlement (New York: Houghton and Mifflin Company, 1973), 165; French in Wisconsin, The Wisconsin Historical Society website, http://www.wisconsinhistory.org/dictionary/index.asp?action=view&term_id=11055&keyword=french, last accessed May 30, 2012. ^ Milwaukee (Brief History), Wisconsin Historical Society website, http://www.wisconsinhistory.org/dictionary/index.asp?action=view&term_id=5036&keyword=Milwaukee, last accessed May 30, 2012, now available as “Milwaukee, Wisconsin History,” Wisconsin Historical Society website, https://www.wisconsinhistory.org/Records/Article/CS1607, last accessed July 19, 2017; John Gurda, The Making of Milwaukee 3rd ed. (Milwaukee: Milwaukee County Historical Society, 2006), 12-18. ^ French in Wisconsin, The Wisconsin Historical Society website, http://www.wisconsinhistory.org/dictionary/index.asp?action=view&term_id=11055&keyword=french, last accessed May 30, 2012; “Milwaukee (Brief History),” Wisconsin Historical Society website, http://www.wisconsinhistory.org/dictionary/index.asp?action=view&term_id=5036&keyword=Milwaukee, last accessed May 30, 2012, now available as “Milwaukee, Wisconsin History,” Wisconsin Historical Society website, https://www.wisconsinhistory.org/Records/Article/CS1607; Gurda, The Making of Milwaukee, 12-18. ^ “Milwaukee (Brief History),” Wisconsin Historical Society website, http://www.wisconsinhistory.org/dictionary/index.asp?action=view&term_id=5036&keyword=Milwaukee, last accessed May 30, 2012, now available as “Milwaukee, Wisconsin History,” Wisconsin Historical Society website, https://www.wisconsinhistory.org/Records/Article/CS1607; Gurda, The Making of Milwaukee, 18-21, 26-27.